Black Dragon has been a name to crop up somewhat regularly in the GI Joe mythos within the last 20 years. First, there was the original EXTREME! figure that carried the moniker in in the late 90s. Then the floodgates opened in 2003, with the introduction of a new, evil Black Dragon character within that year’s collectors club convention set. This new Black Dragon bore no relation to the be-pouched Joe ninja warrior of the previous decade. Along with him, Black Dragon brought his troopers, named (you guessed it) Black Dragon Troopers. 2004 brought us the mind-controlled Black Dragon Ninjas, who bore no affiliation with the second Black Dragon’s Black Dragons. 2011 saw the release of the Black Dragon VTOL, a Cobra vehicle based on the GI Joe Renegades animated series. It was piloted by a Cobra code named…guess what? Cobra Air Trooper. You thought I was going to say Black Dragon, didn’t you? 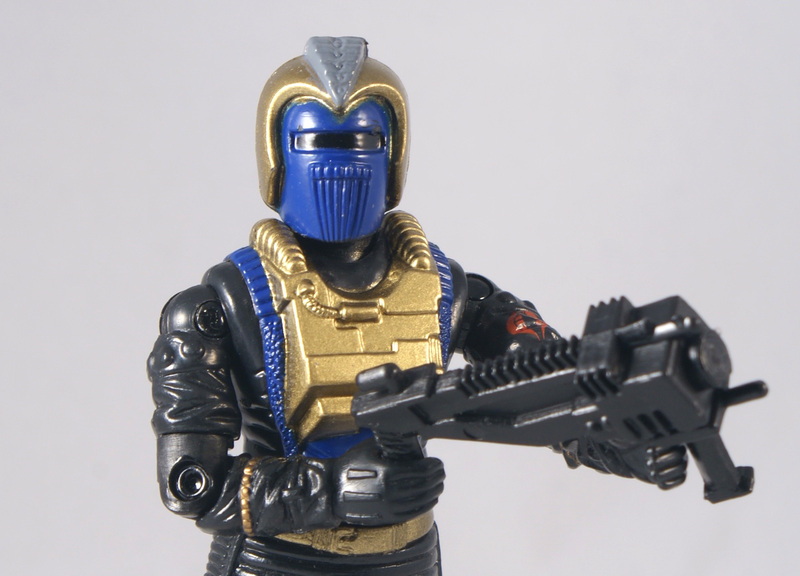 The Black Dragon Trooper is a very slick, intimidating and tastefully colored figure. Made up of two 1988 Iron Grenadiers molds, Ferret and Star Viper, the disparate pieces actually fit together quite well. It’s easy to recognize the unique Ferret helmet and chest molds, but the faceless, intimidating quality of the sculpt works well as a trooper, particularly one that doesn’t carry much of a backstory. Then again, the elaborate and decorative elements, along with the chest unit, bely the origins of the mold as an Iron Grenadier vehicle operator. I suppose that sometimes one shouldn’t analyze these things too much, lest the fun of what is simply a badass-looking action figure be lost. You left out the Black Dragon Ninja from the 2005 Ninja Battles set, an ex-Arashikage ninja who took to firearms more than blades. 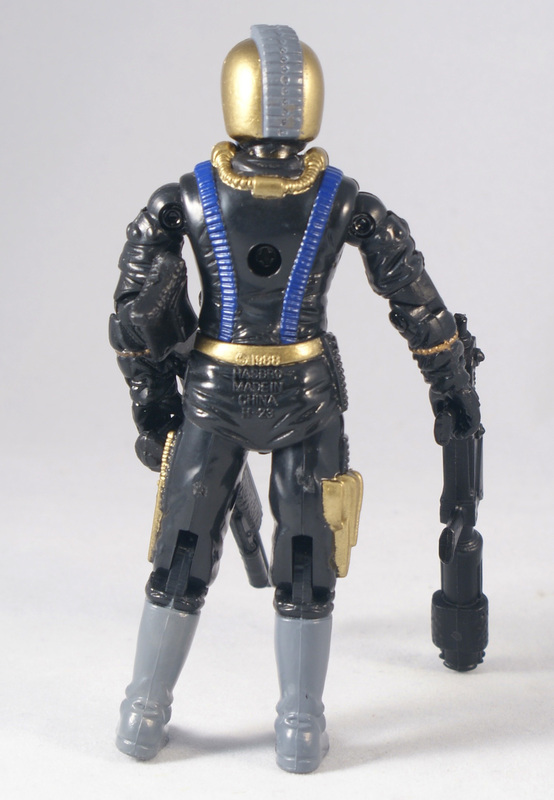 Also, the Star-Viper wasn’t an Iron Grenadier troop, though the coloring would make people think so. So many inconsistencies, and confusions, with G.I. Joe, even in the second decade of the 2000’s. You would think that by now they would have had everything figured out. But no, they still continued to make mistakes. Or maybe they just didn’t care anymore. Or maybe they just never cared about continuity in the first place, because it was always about selling toys, and that was all it was ever about to them. So maybe those mistakes, were not mistakes. Nope, they just never cared enough about us, the loyal fans of G.I. Joe. They just wanted our money. And the prices of the convention exclusive items, is the proof of that. Oh well. As for this figure, all I can say about it, is that I like the color combination. But creating some Cobra trooper that uses a uniform from an Iron Grenadier trooper, or even vise versa, to me is just not right. Just like back in 1990, when the Sky Patrol came out, and there were three members of the team that wore Cobra trooper uniforms in different colors. Two of them were Cobra pilots, and the other one was the driver of the Stun. That still bothers me to this day. I am sure that the design team could have used other Joe figures body parts for those three members. They also did the exact same thing with the figure called Skystriker back in 1988. And in 91 there was Major Altitude, who had the torso, and the arms of the Star-Viper, minus the head, the legs, and the waist that was actually from Keel Haul. If you look closely on the belt buckle, you can see an anchor on it. What a mess. I have always wondered, why did the Star-Viper had the exact same colors of the 88 Iron Grenadier trooper, the 88 Destro, and even the Ferret trooper, except for the pants, which should have been black, not tan. Those colors were also used on other I.G. figures. This figure just like the Undertow, started out as an I.G. trooper, and then got re released in the early 2000’s as a Cobra trooper. What the heck? Huh, nothing. Just more inconsistencies with G.I. Joe. That’s all, folks. Relax, JAMES. GI Joe has ALWAYS had repaints going back to the OG13, some better than others. Stop being a grouch and enjoy. I don’t mean to be a grouch, but I just wish that there had never been any inconsistencies in G.I. Joe. Especially in the 2000’s. Do you remember that female Dial Tone character from the 2009 movie. I read somewhere in the net that she was turned into the original Dial Tone’s sister. Also there was a female Doc figure that is supposed to be the original Doc’s daughter. I’m cool with that. Now when it comes to repaints, I love repaints. I have been loving them since 1988, when I first saw the Tiger Force figures at a local Kmart store, and I went nuts. I wanted the Duke, Flint, Dusty, and the Bazooka, figures so bad. Which I ended up getting anyway. To me those repaints were the only way to get those characters in my collection, because when I started collecting G.I. Joe figures in 1987, I missed all of those figures that were made before 1986. Even some of the 86 figures, like the Vipers, and the B.A.T.’s, where getting harder to get at that time, specially after G.I. Joe The Movie was shown on tv. So, I like repaints of classic o-ring figures very much, but not the ones like this one that had their original names changed. The Iron Grenadiers folded after 1990 as far as the toys went. Metal-head and TARGAT worked for Cobra after that. They also never existed in the 90’s cartoon (Annihilators, TARGAT, Metal-Head and Undertows were all Cobra), and in Europe all of Destro’s army were released under Cobra, no special colored backgrounds. Yes, Hasbro didn’t care about continuity that much. 1991-1992 was a soft reboot of the toys with old favs returning and 1992’s Destro being Cobra’s weapons supplier without any explanation on his filecard. Thank you for that information. I had read something about that on the net years ago, and it reminded me at that time, about one of the Marvel comics from 1988, I think, where it shows a part where Cobra Commander, and Destro are about to fight each other in some war, and at the end they don’t fight. Instead Destro walks up to Cobra Commander, and says to him something about him knowing that he was not the real Cobra Commander. And supposedly, some sort of union between Cobra, and the Iron Grenadiers is created right there. Then there was the Operation Dragonfire mini series where they show a scene where the Annihilators are shouting cobra as they are attacking some Joes. And then the Undertows yelling cobra in the 1990 episodes. I have always preferred the idea of Destro having his own private army, while still supplying Cobra with weapons, and maybe even the materials to make vehicles, planes, etc. And why not have also other enemies for the Joes to fight. Like the Dreadnoks, the Evil Head Hunters, the I.R.O.N. Army, the SKAR forces, or even the Shadaloo. Yeah, 1992 was a throwback year for G.I. Joe. I think it might be possible that the Hasbro folks did that because they were not making a lot money from the new character’s figures that they released at the beginning if the 90’s. So they decided to bring back the old fan favorites mixed in with a few new characters. And according to Yojoe.com, Overlord was released in Brazil as a member of the Iron Grenadiers. And now that I’m thinking about it, I’m wondering if the Decimator figure, and the Hammerhead vehicle, were originally meant to be part of the Iron Grenadiers subset. Not a fan of this figure. The Ferret was just too out there and I’ve never liked him as a figure, either. Recoloring it in blue and black didn’t really do anything for me. So, this figure really stands as a wasted opportunity of something that certainly could have been better. Star Viper wasn’t an Iron Grenadiers character…he was 100% Cobra…surprised you made that mistake and no ones noticed!